Graduate of the French Ecole Polytechnique, Graduate of the French National School of Advanced Engineering (ENSTA). Various senior positions at the Délégation Générale pour l’Armement (the French Defence Procurement Agency), including Director of Co-operation and Industrial Affairs (2001-2005) and Deputy Chief of Defence Procurement (2005-2008). Several experiences as an advisor to French Ministers, among which Defence and Industrial Affairs Advisor to Lionel Jospin (Prime Minister) (1997-1999) and Deputy Director of the civil and military cabinet of Alain Richard (Minister of Defence) (1999–2001). Senior Director at Alix Partners (2009–2011). Chairman and CEO of CS Systèmes d’Information (2011-2013). Deputy CEO at Sopra Steria since 2013. 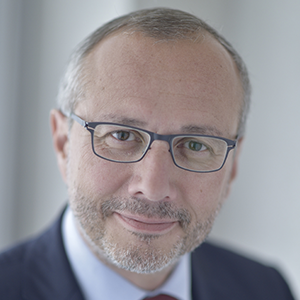 Other roles: Board Member of Défense Conseil International since 2012, Vice-Chairman of the Conseil Général de l’Armement (General Armament Council) since 2016, Chairman of the Fédération Syntec (representing the French IT, Engineering and Consulting companies and their 900 000 employees) since 2018. L’Armement français au XXè siècle: une politique à l’épreuve de l’histoire (Editions Ellipses, 2000). Officer of the Legion of Honour, Officer of the National order of Merit.